There are many website builders out there, and most of them have a range of services on offer. You can begin with the basic free website builders and hosting, but the chances are that at some point you'll want to move on to the premium or VIP version to get better features, storage, and other boons. Here is our review of the premium plans from the best website builders so that you can choose the best option for the best price. Wix offers a whole range of premium and VIP plans for website owners who are ready to upgrade. Free hosting, a free domain name, unlimited pages, and premium support are included in its top-priced Unlimited package as well as in the next step down Combo plan. Both are ad-free and come with 20GB ​of free storage, too. However, Wix’s Unlimited plan brings you unlimited bandwidth as well. The Wix Unlimited plan is not the cheapest around, but it includes loads of top features that bring you real value for money. These include marketing boosts like $75 for Google Adwords, $50 for Facebook ads, and 20 free email marketing campaigns each month via Wix’s marketing tools. Professional site review and excellent Ecommerce tools for a complete online store are thrown in, as well. One of the few drawbacks is that there’s no capability to sell digital downloads direct from your Wix site. Additionally, business email is not included, but it can be added on for a reasonable $4.08/month. Overall, Wix brings great value for money with prices which are not a lot higher than other website builder premium plans. SiteBuilder’s prices are among the lowest around, but its lack of features hold it back. If you’re only looking to build a website for marketing purposes and don’t intend to sell ​through it, SiteBuilder could work for you. It’s very reasonably priced for free hosting, your own domain name, priority support, and an ad-free website as well as an extensive suite of SEO and analytics tools. However, storage is limited to 10GB even on the top plan, preventing you from adding a lot of high-resolution images or videos. You’ll have to add $4 a month for its Ecommerce plan to host an online store, which is essentially the same as its Premium plan but with the addition of a full Ecommerce suite. In essence, SiteBuilder is low on cost but also low on value. Web.com’s premium plan has many pluses, such as excellent Ecommerce tools and features and great-looking personalized business email. It offers free hosting with unlimited data, disk space and data transfer, and free domain registration for the first year. Unfortunately, after the first month of lowered prices, the cost of its premium plan is very high. Added to that is the ongoing cost of renewing your domain each year, which is steep at $37, and other useful paid add-ons which bring value but also increase the cost. GoDaddy’s premium website building plan using its GoCentral option is competitively-priced. It includes free hosting and a giant range of features, including SEO, social media and email marketing tools, and an SSL certificate for security. If you aren't planning to sell online, GoDaddy's premium plan brings a lot of value for money. However, if you need an online store, then you'll double your costs each month for a full suite of Ecommerce tools. Admittedly, the tools are impressive, including a multi-device shopping cart, credit card payments, ability to configure products, and abandoned cart recovery and the price is not much more than that charged by Wix, but the Premium plan without a store is far better value for money if it suits your needs. Somewhat similar to GoDaddy’s pricing structure, Weebly has a Pro pricing plan which is great value for money for small businesses that don’t need extensive Ecommerce capabilities. For $12 a month, you get a huge amount of premium features including SEO, analytics and marketing tools, $100 in Google ads, excellent customer support, and an ad-free site. You also get unlimited hosting, unlimited pages, and a free domain name. However, the Pro plan only lets you sell up to 25 products and charges a 3% transaction fee, making it an inefficient choice if you expect to directly sell more than a handful of things a month. The business plan option takes all this and adds better Ecommerce capabilities including managing inventory, a shipping and tax calculator, coupons, and SSL security as well as removing the transaction fee. Weebly’s business plan is not as packed with Ecommerce tools as GoDaddy, but its Pro plan is better value for money. Site123 only offers one level of paid plan, and that does not offer many more features than its free version as you can get free hosting, free domain name, and take credit card payments even on the free plan. With its Premium plan, storage and bandwidth increase, but only to 20GB and 5GB respectively which is tiny compared to some of the other website builders who charge the same price. It does bring a good array of Ecommerce tools, removes ads, and adds the option to connect your existing domain. Still, Site123’s Premium plan falls a long way behind the rest of the market. Deluxe’s website building and design tools are fantastic on its premium plan but don't offer such great value for money on an ongoing basis. Its top-priced plan is extremely expensive, and while it does offer you free hosting, a free domain name, solid social media integration, email marketing, and analytics tools, some might consider its SEO tools lacking and a business website is limited to only five pages. Deluxe is best used to build an amazing website and then move on to something with better value hosting, Ecommerce, and storage options. Shopify's Advanced plan brings extensive Ecommerce features, but you certainly pay plenty to access them. This is the most costly premium plan option and if you add paid add-ons, the price mounts quickly. That said, businesses that need full Ecommerce capabilities could find it worth it. Its Advanced plan brings unlimited storage and number of products, 0% transaction fees, shipping discount, the ability to print shipping labels, offer discount codes and gifts, abandoned cart recovery, and a lot more. Shopify adds a high level of security with a free SSL certificate and fraud support. However, its mid-level plan includes almost all of the same features for a third of the price of the Advanced plan. Most small businesses might find it fits their needs and brings much better value for money, although it’s still expensive compared to Wix. 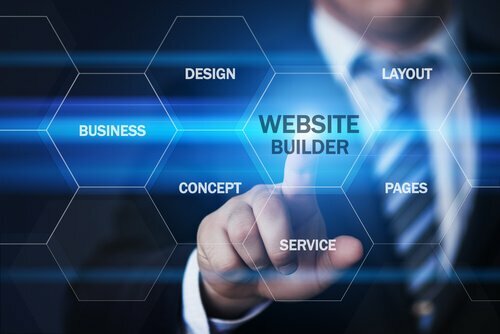 Ultimately, your choice of the best premium website builder for your small business is going to depend on what you need. You’ll make a different choice if you sell thousands of digital downloads than if you need a website for your auto retail business, for example. Above, you’ll find all of the information you need to review cost versus benefit and make an informed decision about the best premium website builder for your needs. Alternatively, you can check out our in-depth reviews here. Sarah Pritzker is a content writer with years of experience and a keen interest in the vast world of online consumer products. She enjoys helping readers make sense of the options on the market in industries including Website Builders, VoIP, hosting and VPN.